Gretna Green Wedding Venues - Choose From Over 10 Venues from £195! Our Gretna Green Wedding Team offer a range of historical, traditional and modern Venues for your Wedding Ceremony. Our wonderful choice of venues, receptions and packages can be booked via our experienced Gretna Green wedding planner team. 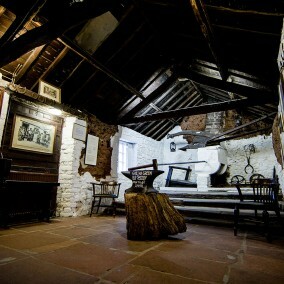 Unique settings for your wedding ceremony such as the Famous Blacksmiths Shop, Gretna Hall Marriage Rooms or the Old Toll Bar, Gretna. 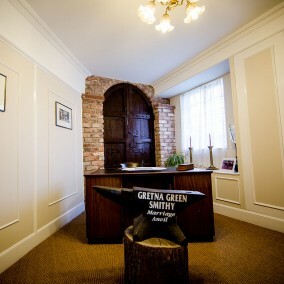 Or you might choose the modern, contemporary feel of Smiths Hotel, Gretna Green – just a few yards away from the Blacksmiths's Shop - or Greens at Gretna Water Gardens; again in nearby Gretna. 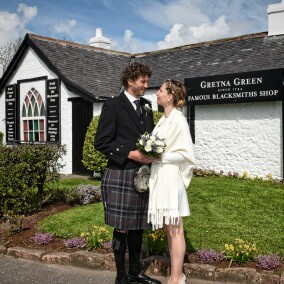 Since 1754, the Old Blacksmiths Shop in Gretna Green has been the home of runaway love and is now considered the UK wedding capital; and probably, the most famous Scottish wedding venue in the world. Here, you too can follow in the footsteps of over 260 years of couples, drawn to the Blacksmith's anvil, to forge their love in an unbreakable bond and join their hearts together in marriage. A romantic, enchanting, spine-tingling and truly unique wedding experience for you, the bridal couple and your guests, should they join you for your special day. Here at the Famous Blacksmiths Shop, you can not only marry, but renew your vows, enjoy a romantic anvil blessing or even a spontaneous blessing or handfasting... all in the home of the Anvil Wedding! Choose to marry at the most renowned of historic marriage houses, The Famous Blacksmiths Shop venue, situated at the heart of Gretna Green village. 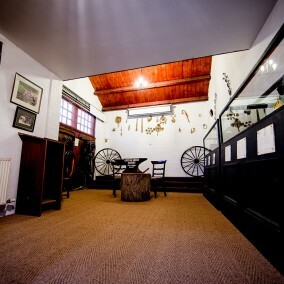 Our three Gretna Green wedding venues, within The Famous Blacksmiths Shop, are suitable for wedding parties with less than 10 and up to 55 Guests, accommodating 100 guests in total. The 18th Century historic marriage house, at the centre of Gretna Green, welcomes you with a grand sweeping entrance and open fires. This grand old lady has been at the heart of Gretna Green's history of runaway weddings for over 200 years. New to our family business it is getting the love and care it deserves to make it a stunning choice for you and your wedding guests. 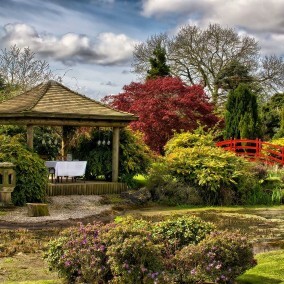 With 10 acres of gardens, ornamental ponds, gazebos and "Kissing Gate", it makes the ideal location, not only for the wedding and reception itself but for photographs to help your memories last a lifetime. If you are looking for a more modern feel for your wedding ceremony, within Smiths Hotel at Gretna Green, there are two superb Gretna Green wedding venues: Smiths Penthouse Balcony and Smiths Marriage Room. Smiths Marriage Room is a versatile wedding venue accommodating from 20 to 150 wedding guests. 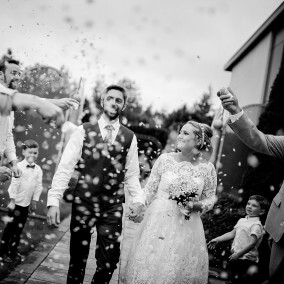 The Water Gardens, with views over the Solway Firth, offer an outstanding location for your wedding ceremony and provide the perfect backdrop for your wedding photography. A simply stunning outdoor wedding venue, which changes with the seasons, the Water Gardens at Greens at Gretna Hotel offers a unique alternative just a stone’s throw from the border river. The gardens are maintained all year round and allow for a beautiful open-air setting for your Gretna anvil wedding. Accommodating up to 35 guests, the Water Gardens can be booked venue only, or included in our various wedding packages. In the nearby township of Gretna, you can choose Anvil Hall. This Gretna wedding venue is a unique and beautiful building, formerly a church. For more information about booking Anvil Hall, including pricing and availability, please call our wedding planners on 01461 338441. If a Gretna Church Wedding is your preference, Gretna Old Parish Church venue provides wedding accommodation for up to 250 Guests. Parts of Gretna Old Parish Church date back to the 17th Century and the history of the Gretna Green church can be traced to medieval times. 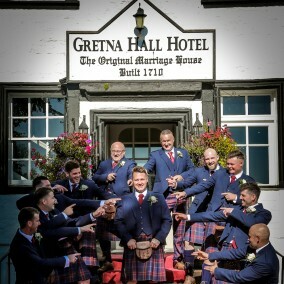 Details of the Church of Scotland minister for Wedding Ceremonies at this Gretna wedding venue will be provided by Gretna Green Wedding Team at the time of your booking. For more information about booking Gretna Old Parish Church, including pricing and availability, please call our wedding planners on 01461 338441. Marry in style within this magnificent ancient tower house only 5 miles from Gretna Green. This venue's roots date back to 11th Century but was rebuilt in 16th Century during the times of the notorious Border Reivers. Bonshaw Tower is surrounded by glorious, mature gardens which offer a fabulous location for your wedding photographs. For more information about booking Bonshaw Tower, including pricing and availability, please call our wedding planners on 01461 338441. 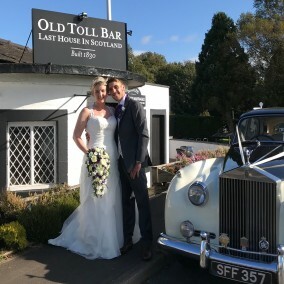 Choose between the cool contemporary 4-star Smiths Hotel, or the historic, luxury Gretna Hall hotel swap or the contemporary Greens at Gretna Hotel for your wedding reception or the lovely Old Toll Bar - First House in Scotland situated in Gretna, for an intimate reception. Smiths Hotel is a wedding venue in Gretna Green that can cater for a wedding reception for between 15-180 wedding guests in our function rooms of varying sizes. Alternatively, Smiths caters for smaller wedding parties if you would like a meal in one our private dining areas, which can accommodate up to 18 people. Gretna Hall Hotel can cater for a couple eloping on their own up to 80 wedding guests in our function rooms. The Ramsey Mackintosh being the jewel in Gretna Hall’s crown which can seat up to 24. Greens at Gretna, First Hotel in Scotland, offers traditional dining in a contemporary setting. Hosting from just the two of you up to 100 wedding guests.